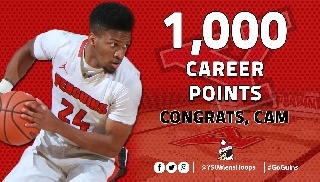 Highland Heights, Ky. -- Junior Cameron Morse scored the 1,000th point of his career after scoring 13 points but the Youngstown State men's basketball team dropped an 83-70 decision to Northern Kentucky on Thursday evening at BB&T Arena. The Penguins fall to 7-9 overall and 1-2 in the Horizon League while the Norse improve to 11-5 overall and 2-1 in the league. Junior Francisco Santiago nearly missed his third straight double-double with 11 points and nine rebounds and sophomore Devin Haygood tied a career high with 11 points. Senior Brett Frantz also reached double figures with 10 points. Northern Kentucky was led by Mason Faulkner's 24 points and Drew McDonald's 15 points. Down five, 18-13, midway through the first half, Haygood's old-fashioned three-point play and putback tied the game up at 18 with 7:55 left before halftime. The Norse, however, scored 17 of the next 19 points to close out the half with a 35-20 lead. The Penguins, who shot just 30.8 percent from the field in the first half, outscored the Norse, 50-48 in the second half but connected on just 13.3 percent from 3-point range for the game. The Penguins visit Wright State, Saturday, Jan. 7, at the Nutter Center. Tipoff is slated for 4 p.m.